How much do you like Tim Howar? Show it! 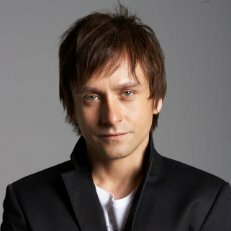 Tim Howar (born 24 November 1969 in Spirit River, Alberta) is a Canadian actor, singer and dancer, known as a London-based rock vocalist with Mike + the Mechanics. His musical theatre credits include The Phantom of the Opera, Chess, On the Town, Tonight's the Night, Rent, Shoes and Rock of Ages. Tim Howar is currently co-fronting the newly reformed Mike and the Mechanics, with Mike Rutherford from Genesis and Andrew Roachford. His theatrical and musical endeavors have seen him star and play in every major theatre and city across Canada, the United States, Europe, and the whole of the UK. In London he writes and creates many new music and pop projects. Recent projects include the Abbey Road 80th Anniversary concert with the Royal Philharmonic, ‘Shoes’ for Sadlers Wells, ‘Wrong Songs For Summer’ and ‘Uncle David’ with the composer Richard Thomas. He also starred in ‘Rent’ (10th anniversary cast on Broadway); ‘On The Town’ for the ENO and Théâtre du Chatelet, Paris; The Who’s ‘Tommy’; ‘Peggy Sue Got Married’; ‘Tonight’s the Night’ the Rod Stewart Musical; ‘Les Misérables’ with Colm Wilkinson; and as a guest soloist for Friday Night is Music Night for the BBC. He has also sung with the Halle Orchestra, the National Orchestra of Belgium and the London Philharmonic Orchestra. Our #FirstNightTakeover series continues with Perry O’Bree at the West End premiere of CHESS, starring Michael Ball, Alexandra Burke, Cedric Neal, Tim Howar, Cassidy Janson and Philip Browne at the London Coliseum (on 1 May 2018). Did Perry thank Benny Andersson, Björn Ulvaeus and Tim Rice for the music at the after party? The game is on: Who's joining Michael Ball & Alexandra Burke in Chess at the Coliseum?